Solid Black Twin Bedskirt by VHC Brands | P.C. Fallon Co. 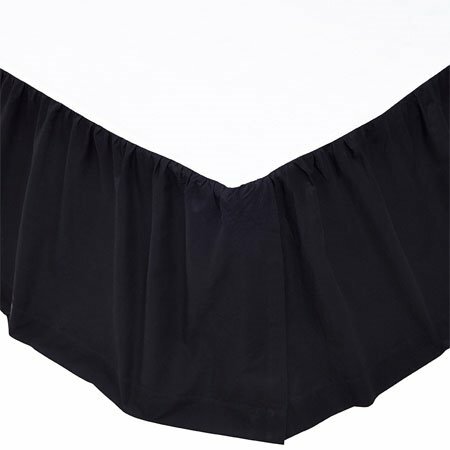 The Solid Black twin bedskirt measures 39"W x 76"L with a 16" drop. Ruffle ratio is 1.2 times the deck length on three sides, gathered. The front skirt panel overlaps the side panel 2.5" at the front corners. This item is imported. Please note, colors may appear differently in different resolutions and on different computers. From The Victorian Heart Collection made by VHC Brands. Manufacturer's UPC code is 840528101755.